There are approximately 2,000 species of scorpions in the world organized in 6 superfamilies and 13 families distributed across several continents. Only about 30 to 40 species have a poison capable of killing a human being. Bothriuridae with about 148 species. Buthidae with about 800 species. Chaerilidae with about 43 species. Euscorpiidae with about 11 species. Vaejovidae composed of 17 genera. The Buthidae family is the most numerous with 800-900 species grouped in 87 genera. The bark and the fattail scorpions, some of the most dangerous in the world, belong to this family. While there are many species of scorpions, some are more popular than others. The emperor scorpion (Pandinus imperator) is one of the best-known and popular. Its length up to 7.9 inches and weight up to 30 grams, makes it the largest scorpion species in the world. Besides, its intense bright black color makes it even more intimidating and shocking. Hearing or reading the name of the Indian red scorpion (Hottentotta tamulus) may not tell you anything, but this small scorpion with a length of 1.9- 3.5 inches represents the most deadly scorpion in the world, being the children and the elderly its most frequent victims. India, Pakistan, and Nepal are their places where it dwells. The Arizona bark scorpion (Centruroides sculpturatus) is a short, yellow species that inhabits the deserts of northern Mexico and the southern United States. It has a length up to 2.7 inches, but you should not get relaxed by its size because it is the most poisonous scorpion in North America and the perpetrator of many stings to humans. 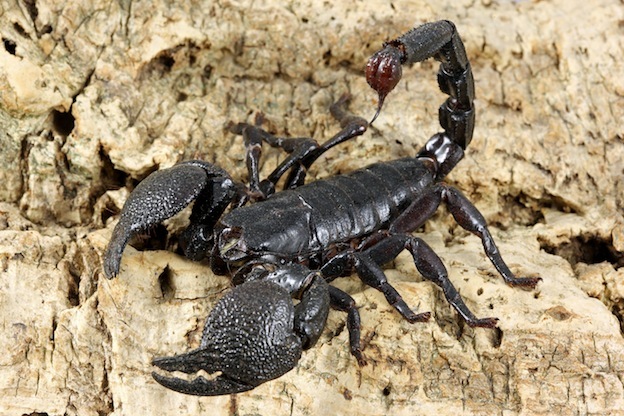 This genus groups 18 scorpion species which are some of the most poisonous and dangerous in the world. They inhabit in semi-arid regions of the Middle East and Africa, and their main characteristic is a thick and large tail. Finally, the Deathstalker (Leiurus quinquestriatus), popularly known as the Palestinian yellow scorpion the Israeli yellow scorpion, the Omdurman scorpion and the Naqab desert scorpion, is characterized by a painful bite but its venom does not cause death in most cases. Only children and people with heart problems could have very negative reactions in their body. To name just a few examples, the Utescorpio is an extinct genus of scorpions that belong to the Buthidae family and contained only one species that inhabited the Earth by the middle of the Eocene period. This scorpion named “Uintascorpio halandrasorum.” Although only 9.9 inches of its body is preserved today, it was a species with a length up to 15.7 inches. “Tityus exstinctus” is an extinct species also belonging to the Buthidae family. There is only one individual, discovered in 1884 north of the island of Martinique, Saint Lucia, in the Caribbean Sea. The pseudoscorpions are creatures that are often confused with scorpions, but after a more detailed observation, we can realize that they are very different. They are also known as false scorpions because their front is very similar to that of a scorpion as they have chelicera, pedipalps, as well as four pairs of legs, but the difference lies in the posterior part lacking a metasoma and a sting. Differentiating scorpions is a difficult task because they are similar in color, size, and characteristics, but the important thing to know is that there is a huge diversity of them as well as the peculiarities that distinguish them from other known groups of arachnids.